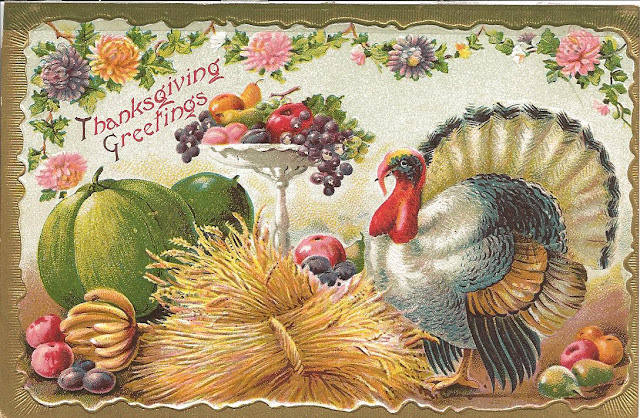 Hope you all enjoyed a wonderful Thanksgiving with your family and friends. It seems the very moment you put the leftovers in the fridge, and say goodbye to your company, that preparations for Christmas begin! We packed up the Thanksgiving decorations in record time this year, immediately hauling out the many boxes of Christmas decorations (I won't confess exactly how many!) to begin the holiday ritual of Decking our Halls. A funny thing happens at our house during this time. It kinda looks like we're moving. Boxes are everywhere. There are big empty spaces where nic nacs and quilts used to be. Our little dog, Bella, wanders around looking a bit unsettled and confused. She's not the only one. Years ago, I organized our decorations in separate boxes, one (a-hem.....or more) for each room. I try to tackle a room a day. We also have our respective jobs to attend to, so.....sometimes it's a room every couple of days. My focus isn't on getting it done in record time anymore, I really want to enjoy the ride, lingering over the things the kids made when they were little, or a Santa I made years ago while sewing with my friends. Then there's the discovery that while unpacking these boxes, I don't like some decorations anymore. I want to pare down. What to do with this stuff? The kids want me to keep it...."we've had it for years, Mom. It's part of my childhood!" Sigh. It was something that Great Aunt So and So gave to us. I never liked it all that much! I was only being nice when I displayed it all those years. I don't display it anymore and can't get rid of it, so back in the box it goes. Tomorrow, I'm looking forward to Christmas shopping at the mall with my kids, who are now all grown up. I might steer them in the direction of Santa, and see if they'd be willing to sit on his knee again. Good memories and funny pictures. My goal is to have the house decorated by Sunday. So, what does all of this have to do with quilting? Nothing...except it's what is keeping me from sewing and having something more interesting to talk about. It's what we all do this time of year, and no doubt, some of you are doing it, too! Are you making Christmas gifts this year? Planning special get-togethers with friends? What special traditions do you celebrate? How is your shopping and decorating coming along? Any advice on what to do with those old, unwanted decorations? Every day, I am so grateful for the many blessings that are bestowed upon my family, friends, and of course, myself. I try not to wait until Thanksgiving to count them and appreciate them. I think there's a whole lot of truth to the addage that living a grateful life is a happy life! As I stated in my last post, I have my share of troubles, challenges, and worry like everyone else. Through it all, I try to keep my humor, and learn lessons from the experiences. I don't always like it, but I try! Thankfully, the blessings and good things are more plentiful than the unpleasant stuff. I love my family and they are always there with and for me. I am so blessed to have the very best friends in the world, and I know I'm lucky to have a job I love. Working and living in the quilting world has enhanced my life in countless ways. Piecing brings me peace of mind, heart, and soul. It's a wonderful outlet for my creativity, and has brought me the best quilting pals, and work I truly enjoy, allowing me to meet other kindred spirit quilters. It is my sincere hope and wish everyone reading this will have a blessed Thanksgiving holiday. May your life be filled with people you care about, good health, and the little trials and tribulations that come along be few and far between. Each one of you, dear readers, are among my blessings! I thank you very much for taking the time to visit with me today. As many of you know, about a week ago I experienced a nightmare problem with my computer when Windows 7 did an automatic update leaving me unable to access any files on my computer for about 5 days. Many of you left me very supportive and hopeful emails which really helped!! Microsoft was very good with their tech support, and worked with me to resolve the problem.....I thought. I did get a good four days work in, and was able to finish Journey Three before it happened again last Wednesday! Different problem, but still no working computer. I must have a computer gremlin in here somewhere! Ugh. For better or worse, I was scheduled to leave home early Thursday morning for a two day trip, so I sent an email to tech support at Microsoft, and packed the car, resolved I would handle my computer problems when I returned home. I'm so glad I had the diversion of the trip to take my mind away from the frustration!! I headed to Ottawa, IL, a destination not too far from home, to meet with one of my bestest quilting pals, Lynne Hagmeier (of Kansas Troubles fame!). She drove a whole lot farther than I did (thank you, Lynne!!) so we could meet and catch up on quilting news, family stuff, do some work together, and have some fun. We spent the entire day Thursday antiquing, and boy did we find some good stuff! It was just sitting there waiting for me! My hubby was happy to find out that I did his Christmas shopping for me, too! Thanks, sweetie....you knew just what I liked! That evening, Lynne and I met with our Alaskan cruise director over dinner. We heard a lot more about the awesome destinations we will visit, what fun excursions are offered, and we shared more about our project ideas with her. She loved what we have planned so far, and gave us new ideas and tips for how to proceed. We're very excited and happy with how things are coming along. The remaining hours of the evening were spent in our pajamas, drawing sketches, and tossing fabrics around, continuing to design our joint project. We're loving how it's coming together and its been a real kick working with Lynne! We still can't believe that we're headed for Alaska next summer. I remember when I was a kid... thinking about Alaska, and how it seemed such a far off, exotic place where Eskimo's lived in igloos, and where the sun could be out 24 hours, or never be seen at all. Not only has Alaska been a bucket list destination for hubby and me, it's also a requirement of another bucket list item I have....to have stepped in all 50 of these beautiful United States! Lynne and I would sure love to share this experience with you! If Alaska is on your 'want to visit someday' list, please think about joining us on our "Great Girlfriend Get-Away" aboard Norwegian Cruise Line's ship The Pearl (although my kids and I would really love it if it were the Black Pearl!! Teehee). Click here for cruise info. Friday, Lynne and I said our good-byes, and she started her trek home. I spent the evening with the lovely ladies of the Illinois Valley Quilters Guild. Quilter's are the best people to hang out with any day, any where (like on an Alaskan cruise! ), and the IVQG ladies were no exception! They all gave me a warm welcome as we shared a meal, and at the guild meeting as well. Saturday brought a return to reality.....unpack the car and face computer problems. With help from my family, we unpacked the car. With continued help from Microsoft, which took 2 more days, they helped me solve the computer problems. Life is full on all kinds of trials and tribulations that come and go. While it felt like the weight of the world was on me with the second round of laptop troubles, it was great to leave it all behind, and have some fun with Lynne and the guild ladies. All is well now (I hope! ), and I can hear those words my mom says all the time...."this, too, shall pass". As we all approach our day of thanks, I focus on what I have to be grateful for. I hope I can say, over the next many months...that I'm grateful that my computer problems didn't return. Only time will tell! Keeping good computer thoughts!! PS....I'd love to visit your guild! Click here to see my lecture and workshop offerings. 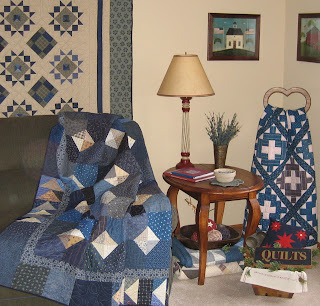 Have you ever been to a quilting retreat? If not, you owe it to yourself to experience the wonderful gift of spending time with your girlfriends, in a beautiful setting, where you can quilt the day (and night) away! If you have, then you know all too well what I'm talking about! And... have I got a place for you to retreat to!!! About a week ago, my friends and I packed the cars and headed for Wisconsin (the Madison area), to the Mill Creek Settlement Retreat, owned by Theresa & Ross Halverson. What a wonderful time we had at their totally awesome country home! And....I do mean country home!! This turn-of-the-century house is located on 67 acres of land, situated at the top of a hill, and surrounded by farm fields, livestock barn, chicken coop, and grain silos (although there were no livestock or chickens at the moment!). Theresa & Ross restored the house themselves, where it initially was a Bed & Breakfast, and is now (lucky for us!) a retreat home. The Halvorsens are very talented at restoration! Their workmanship is masterful, and creative, making the house comfortable, warm, and inviting! You truly feel like you've taken a step back in time to how the house may have been in the early 1900's. I'm a Prairie Woman at heart, so I spent a lot of time walking thru the rooms imagining what life would have been like then. .....The Halvorsen's primitives store called Yore Primitives (as in....days of Yore!). Yore Primitives is located just a short distance from Mill Creek, and you know we all went there and bought lots of goodies for our homes!! It was wonderful! ......giving us lots of creative inspirations everywhere you look! ......with enough beds to accomodate 14 retreaters. .....deciding which of the 14 beds you want to sleep in! Is this not the lovliest old-fashioned bathroom you've ever seen? The work space is large and comfortable with excellent lighting. I brought several UFO's to work on and completed a few. My friends were very productive as well, in between bouts of "Patchwork Sing-a-longs" and other fun activities that I just can't talk about. You know how it is....what happens at the retreat, stays at the retreat! Vegas....eat your heart out! Some meals are included at Mill Creek Settlement, and the warm, make-yourself-at-home welcome is free of charge! Theresa and Ross made sure we were happy, comfy, and well fed, and we thoroughly enjoyed their company!! We've already booked two return trips next year! If you'd like to know more about the Mill Creek Settlement Retreat, and/or view pictures and get more information about it, click here! I think when we find good things in life, we need to share them, and Mill Creek is a very good thing! Thanks for taking the time from your busy day to spend a few minutes with me! It bears repeating that I thoroughly enjoy reading your comments!! Thanks to all of you who have taken the time to comment these past few weeks. In my last post, I asked about what skill level you look for in a quilting pattern, and found your answers delightful and familiar. Like so many of you, I love a challenge, and try to expand my quilting horizons each year to learn or make something totally out of my comfort zone. Generally, I look for a more complicated block, but love the easy classics, like a Nine Patch and Churn Dash, just the same. I'm totally a traditional quilter at heart, and enjoy the entire process of piecing, no matter what the block may be. Getting to the important part of today's post....I give you the winner of the Frontier Foundations pattern! Being that today is 11-11-11....I just had to choose comment number 11...... Lesley!! Pam, Frontier Foundations is gorgeous. You are so talented! I have been quilting for over 30 years, and would consider myself intermediate skill level...I'm not too willing to create anything new, but I can follow most patterns. I hand quilt, but not very fast so I try to keep a few projects on the go...one to piece, one to quilt, one to embroider, and projects to cut...of course, that just delays me from finishing one, but it keeps life interesting! I would love to win this kit! Congratulations, Lesley! Please email your address to me and I'll get your kit out to you. On a side note, I have major computer problems here. Yesterday, I opened my laptop to find that Microsoft Windows 7 did an automatic update to my computer (even though it was completely shut-down! ), and in so doing, wiped all of my documents, pictures, EQ drawings, and iTunes completely clean! My computer sits here as if it were brand new and never used with absolutely nothing on it. Needless to say, I'm devastated. (Sob, sob, sob) I know what you're asking....did I have a back-up? Yes, but it's from September (which is waaaayyy better than nothing!) I've been working very hard writing the patterns and shop guide for Journey Three, feeling the pressure to get it done, totally forgetting to back-up all of that work!! A mistake I promise I will never make again. Thankfully, all of the Journey Three patterns were saved to a flash drive!! I took the patterns the printer that way, so those I can install again (Sigh!). Not so lucky for the shop guide, although I did make hard copies of part of it so I could proofread them. That's a little something, too! The reason I share this with you is two fold....to emplore you to do whatever is necessary to save your work! Don't be so busy that your back-ups are not a priority! (I say this more to me than you, while I shake an index finger at myself!) The other reason is that all of my professional Journey Three quilt photos are gone, too (temporarily - I can get those again!) ....so I quickly took a few pictures with my camera to show you the last two quilts from Journey Three. 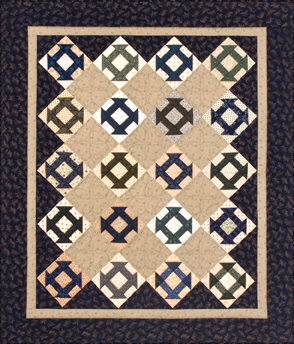 Faithful Circle is another quilt that features the Churn Dash block. This classic block can really change its look depending on where you place your fabrics, which is so fun! Simple, scrappy, and easy is what I had in mind for this quilt. Like Frontier Foundations, I chose the border fabric first, and then pulled the block fabrics from that palette. You can go crazy with scrapping this quilt up, add lots of Make-do's, or choose to make it from just two colors. Lots of possibilities and a quick quilt to make!! Elizabeth's Prairie Garden is the bonus project for Journey Three. When last you saw pictures of this quilt, it was waiting for the applique design. After playing with several ideas, I decided on this little flower motif. It doesn't overwhelm the light blooms, and adds "just a little something different" to the quilt, which is exactly what I was looking for! I chose to make the applique flowers with wool for the added texture that wool gives, which I love, and because it's so easy to work with! I chose wool that was not overdyed, and found just the right colors that work beautifully with Civil War reproduction fabrics. You can order a charm pack of these luscious wool colors from my website by clicking here. I'm very happy with how the whole quilt turned out, and smitten for life with hexagons!! I am very happy with how Journey Three turned out, and thoroughly enjoyed writing six new stories about life for Prairie Women in the 1800's. As soon as I'm able to get the last of my work finished for Journey Three, I'll begin work on Journey Four. I want to thank all of you for your continued support of the Prairie Women's Sewing Circle club! Without you, I'd just be stuck in the 21st century dealing with computer problems!! In my next post, I'll show you the photos of my recent trip to Wisconsin, and a brand new, absolutely wonderful retreat home. (Thankfully, those photos were still in my camera!) Until then, enjoy your weekend, and send me good computer thoughts! I so enjoy reading all of your comments!! Reading thru them all told me we love our lap and throw sized quilts the very best!! I am in total agreement. You can never have too many throws. Most of you enjoy making the doll size or wall hanging quilts, too. They give us a chance to play with blocks and fabric without a heavy investment of time and money. Since we are drawn to making so many different blocks, and there's a never ending supply of lovely fabric, the doll size quilts seem to be a perfect match! 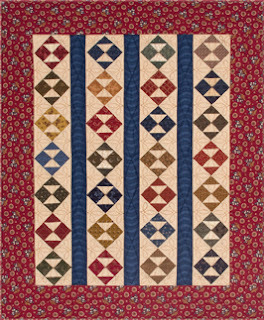 This little quilt combines two of my favorites....the Odds & Ends block, and that oh-so-wonderful red border print that is one of my all time Judie Rothermel favs!! I had a blast creating this quilt, pulling the block colors from the feature fabric in the border. I think it will be really cute made in two or three colors, and all scrappy fabrics as well. To me, it's just a happy quilt. As with all of the other Journey Three quilts, the block is tiny, but easy to make, and there is an alternate pattern to make the block and quilt larger for those who are looking for that. This is your last chance to win a Journey Three kit. To enter, please leave me a comment about the hardest difficulty level you feel you can acheive in a quilting pattern. That is to say, generally, would you tackle a beginner, confident beginner, intermediate, or advanced pattern? What is the quilting skill you most want to learn? Three words about my weekend retreat. OMG! It was just over-the-moon wonderful!! I took gobs of photos. It may take me two postings to show it all to you. I'll be writing about it at the end of the week, so......stay tuned! What fun it has been to read all of your comments about your favorite color combos! So many of you love red...all girls after my own heart!! While I do so love red, it's not the only color I love, and like you blue, green, and black are among my other favs. Many of you are very fond of cheddar, and I'm really trying to get there! Thanks again for taking the time to comment and share your thoughts. Sally from Ca....who said....Since it is fall, I enjoy working with a brown and gold combination of colors. I'm making a scrappy one right now, with cheddar thrown in. It kind of depends on what season it is as far as what colors I like to combine. For year round, though, I love red and white. I absolutely love your colors in Lockridge Mill and would love to win the kit! Congratulations, Sally...please email your address, and I'll get your kit in the mail next week. A Light in the Window combines two more of my favorites......a quilt made of blue and green fabrics, and a Churn Dash block. Playing with the values of the fabrics and putting the blocks on point made this simple quilt a bit more interesting. The blocks are itty bitty, finishing at 3 inches, and cuter than heck. Did you crinkle your nose when you read 3 inches? Not to worry...remember....the pattern now has cutting instructions for a larger size block & quilt! I so love the combo of blue and green that I decorated my living room with it and I love it very much. For me, it's very restful and soothing. Our "conversations" about what blocks you like, and what color combos are your favorites, has me thinking about other things I want to ask you. What size quilts do you make most often? Do you like runners, wall hangings, table toppers? Do you make quilts for your bed, or a lap/throw size for your favorite comfy chair? Do you have a preference regarding rectangular quilts, or are square quilts OK, too? If you're interested in winning a kit for A Light in the Window, comment about all the quilt sizes you prefer. Post your comment by midnight, Sunday, November 6th. I'll announce the winner on Monday. Tomorrow morning I'm taking off on a road trip, headed for what I call the 'holy land of quilting" (tongue in cheek, of course!) I'll be visiting my favorite away-from-home shops in Illinois & Wisconsin - The Quilter's General Store, J.J. Stitches, and The Country Sampler - and retreating with girlfriends at a brand new retreat destination that looks to be just over-the-moon wonderful! I'm gonna try to post lots of pics on Facebook, so you can follow along with me on my adventures. That is IF Facebook and Wi-Fi Hot Spots cooperate!! Don't worry if you're not on Facebook as I plan to post photos on the blog in the next week or so.